Company Overview: Downtown Toronto Establishment located at Ossington and Dundas with a warm and intimate atmosphere while serving a menu filled with great food at affordable prices. 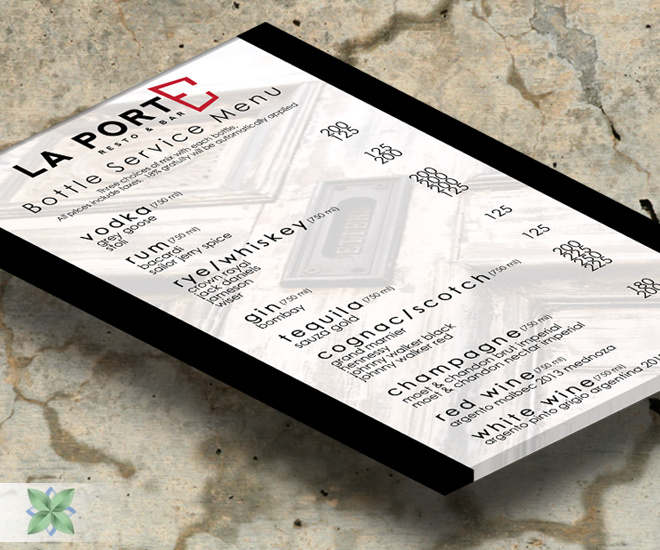 Customer Requirement: Original Bar / Bottle-Service Menu was too large. Need to recreate with new dimensions and a cleaner look while still keeping its existing vibe. Natural Graphics Feedback: It is always a pleasure working with La Porte Ownership. They require professional, creative and fast-turnaround on all projects – And we deliver!